“India Today” reported on its website yesterday that the Indian authorities arrested five suspects for questioning in the attack on the Israeli Embassy in New Delhi, carried out on the 13th of February. According to the report, while examining the security camera’s footage from the street where the embassy is located, the police in New Delhi recognized the face of a biker who attached the IED to the vehicle of an Israeli diplomat. The police also spotted a red motorcycle allegedly used in the attack. Examining security camera footage from the market area where the Diplomat and his wife had gone shopping hours before the attack revealed that several suspects, that were later arrested, were also present at the market. This has lead the New Delhi Police to suspect that the perpetrators followed the Diplomat for some hours and even days before the attack itself. These findings are compatible with the “modus operandi” that the adversary and their agents have used for many years. We know that for over twenty years, terror groups have carried out well planned attacks following long periods of information gathering. This information is gathered over periods of time using well trained agents with the assistance of local operatives recruited to the cause. It should be noted that the attacker himself does not have to be part of the information gathering phase and can be a “fresh” face on the scene. attack before it takes place. event that should be dealt with or not. 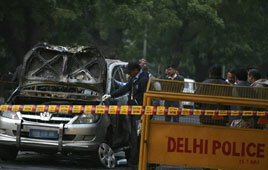 Apparently the Indian intelligence agencies did not have prior information to the attack. Even though there was excessive “interest” of the terrorists to the diplomat’s car, the information was not processed and did not lead to a heightened threat level. The embassy and the market area covered by security cameras. According to Delhi Police the area is defined as sensitive. The speed with which the attack happened & the attacker fled the scene of attack means the attacker was well versed with the local area. Localized terror outfits have never used magnetic sticky bombs which leads to a high probability of ruling out India based or India focused terror groups. Preliminary investigation by Indian agencies in coordination with the Thai police reveal the similar type of magnetic strip used to make the sticky bomb to attack the Diplomat in New Delhi as was confiscated from the apartment of the Iranian national in Bangkok who had thrown 3 hand grenades on police & public on 14th Feb. The role of local Indian operative in carrying out the attack cannot be ruled out. In recent years the phenomenon of increased technological deployment around big cities has grown. Cameras are designed to provide information on adverse events occurring throughout the city. While providing this information has proved valuable for investigation purposes, they have in fact failed to provide real time information needed to stop the attack before it happens. Study and analysis of criminal and security activities in selected areas. Analysis of lessons learned from past terrorist attacks perpetrated by terrorist organizations on similar targets. Integrating relevant technological means to secure selected areas. Creating a model for reporting and evaluation of information for law enforcement agencies. Building Control rooms to run joint operations for the different agencies. Training for joint operations for all agencies involved in the security deployment. Modern terrorism sets a major challenge for law enforcement agencies around the world. It should be noted that many terror attacks were not preceded by intelligence warnings due to lack of gathering capabilities or by lack of analytical processes. In order that we are able to deal with future attacks on our cities we need to be able to analyze and disseminate information gathered by the Human and Technological aspect of our security deployment. This entry was posted in India and tagged blast protection, CCTV, community, critical infrastructure, Human Resources, IED, India, intelligence, Procedures, Profiling, safe city, secure environment, Security concept, terror, terrorists, The Technological Component, training. Bookmark the permalink. Yes, it is more important to prevent terror than after analysis. This tough task falls on the shoulder of organizations like you and us. Congratulations for your successful projects and growing service. However, people are expecting more for their guards, therefore, let’s try harder together.